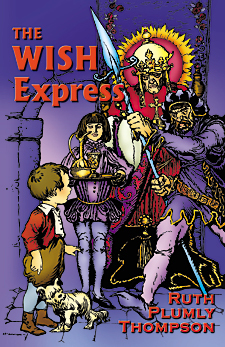 "Marvelous Travels on a Wish, Part 4"
Author of The Purple Prince of Oz, "The Wizard of Pumperdink", "King, King! Double King! ", etc. Originally published in the Philadelphia Public Ledger, August 20 and 27, 1916. Here they meet the "I'm a goin' tos" - who are always "going to do" great things. Aboard the wish once more, the passengers all tell what they are going to be when they reach Somewhere Else. Just as Berens is about to tell what he will be, the wish stops at the Abode of Discontentment, where people carry umbrellas so as not to see the sun. Berens is introduced to the Glooms, a very bluish person! "Always cross bridges before you come to 'em!" cried the little imp, and seizing Berens and Rags, he rushed them over the bridge before they had come to it - and how that was done is a secret - so I cannot tell you. "Now," said the little imp, argumentatively wagging his skinny finger, "you think divisions are hard; well, just you wait till you come to algebra and mensuration and logarithms and geometry and trigonometry - why, you've got books and books and books of 'em to go through with!" "Oh, dear!" sighed Berens gloomily, "I'll never be able to do it! "Never in the world!" chuckled the little imp. "And you," said he, waving his tail at Rags, "have at least two million hairs--well, youre liable to lose 'em, you know, each and every one of them may come out any time!" "What!" barked Rags, sitting down suddenly. "Why, then I'll be bald--b--ald!" he finished with a sob. "That's right, BALD!" said the little imp. Berens was sitting on a hard stone, saying in a depressed voice. "No, I'll never be able to do them--never, never, never!" "Bald! bald! bald!" groaned Rags dejectedly. "Oh, by the way," said the little imp, "let me give you my card," and bounding into the air he scratched two sharp lines between Berens' eyes, repeating the performance with Rags. "My name," said he, with a low bow, "is Wu Ree. I'll see you again." In a moment he had vanished, leaving the two staring stupidly at each other and absently rubbing their foreheads. Then they got up slowly and walked on for a time in silence. Now a turn in the road brought Berens and Rags to a great muddy swamp. Neither of them noticed how very muddy it was, for in about the middle they spied all the passengers of the wish. "Hi! hi!" screamed Berens, dashing in without thinking. "Wait! cried Rags, jumping in excitedly after him. "Why, hello!" called the Dissatisfied Bug, waving its 17 arms genially. "Hello, there! the more the merrier, you know." Berens started to wave, but just then lost his shoe in the mud, and when he had pulled out one, the other had stuck. "I told you there were bogs!" growled Rags irritably, as his feet sank in the slippery ooze. Oh, it was awful! Berens could see now that the others were having just as bad a time of it. The elephant, balancing himself frantically with his trunk, was floundering along like a ferryboat in a fog. The little old lady was squealing dismally, while the poet looked very blue indeed. In fact, just how disagreeable a time they were having of it you can never realize till you yourself have been stuck in the bogs in the State of Discontentment. The only ones who did not seem to mind it were N. V. and the Dissatisfied Bug. They were hugging each other exuberantly and capering along in a mad and merry dance. At last, Berens, by taking off his shoes, managed to catch up with the party. "Most unpleasant State! most unpleasant State!" blustered the elephant, helping Berens along with his trunk. "A frightful State! a terrible State! a horrible State of Mind!" chanted the Dissatisfied Bug, taking the first three steps of the Virginia reel. "An awful State! a hideous State--but a State that you're sure to find," boomed N. V., in a deep bass, bowing low to the Dissatisfied Bug. "The bogs are muddy, the bogs are wet, Cheer up, poor feet; you'll get there yet,"
he chanted dolefully, dragging his long feet through the mire. "I don't mind telling you that this is highly distasteful to me," said the little man who was going to be King, in a complaining voice. "You're very blue," said Sarah Ann. "Oh, very blue." "You needn't talk," said Berens, splashing along sulkily. "You're as blue as bluing yourself, Sarah Ann." Here the whole party began quarreling and fussing and there is no telling how far matters would have gone had not the Dissatisfied Bug suddenly looked at his watch. "Upon my shoe laces," exploded the Bug, "we must hurry," and catching hold of them with his 17 arms he hustled them unceremoniously across the swamp. On the edge of the bog the wish stood waiting and quickly he shoved the party aboard. "Good-by, sweet State," he trilled with a wave of his arm. "Home, sweet home," murmured N. V., as he shuffled back on the platform. "Here we go," neighed the horse, hanging his head out of the window. Again the wish was under way. "Now," said the horse, drawing his head slowly in through the window, "tell us what you're going to be when you get Somewhere Else." "Tell us, tell us!" cried Sarah Ann, and all the passengers looked expectantly at Berens. "Well," said Berens deliberately, "when I get Somewhere Else I'm going to be some one else." "Dear me, dear me!" cried the old lady, throwing up her hands. "Risky, terribly risky," said the horse gravely, shaking his head.
" 'Ow do you know you'll like it?" inquired the Farmer's Boy.
" 'Course he'll like it," said Sarah Ann indignantly. "Why, it will be perfectly splendid. It will be a surprise," she added enthusiastically. Here the whole party fell into quite a discussion about "some one else." "They're awfully stupid," whispered Sarah Ann to Berens. "Let's look out of the window." So the two children climbed upon their knees and looked curiously out of the wish window. They were passing through a wonderful country. The sky was streaked with gorgeous rainbows and speckled with fluffy pink clouds. There was a pink haze over all the fields and hills. In the distance they could see the ocean rippling like molten gold in the sunlight. "Look at the ships!" called Berens in delight. "Oh!" cried Sarah Ann, drawing in her breath sharply. On the rim of the sea a whole fleet of fairy vessels billowed gently up and down on the swells. Oh, but they were the most splendid ships, with richly carven prows and gay silken sails! A great company of people were gathered upon the beach watching the ships with huge telescopes. "I wonder what those people are doing," murmured Berens half aloud. "Waiting for their ships to come in," said the poet quietly. He had been looking out of the window for some time, but the children had not noticed him before. "Will they come in soon?" asked Sarah Ann, in an interested tone. "I'm afraid not," said the poet sadly, shaking his head.. "You see, there's no breeze." "Then they're becalmed!" said Berens knowingly. "What's the name of this place?" "Why, this is Dreamland," replied the poet. "I thought every one knew that." "Look! Look!" cried Sarah Ann, leaning out of the window excitedly. The wish was rushing past a great number of gorgeous castles. There were by no means of the kind you have seen in your history books. No, indeed! There were of a fairy kind, all wondrously misty and magic, with a thousand rooms, perhaps. Strangest of all, they did not rest upon the ground, but floated lightly in the air. 'Neath each one a girl or boy lay dreaming. But no sooner would they waken and try to enter their castle before it would come tumbling down in a million glittering atoms. "Oh, my!" said Sarah Ann, after witnessing several mishaps of this nature. "What's the mater with 'em?" "They're built from the top down," said the poet, "instead of from the bottom up--they haven't any foundations, you see." "Well, if I had one," said Berens, "I'd get an air--"
"Next stop Somewhere Else!" croaked the Dissatisfied Bug, thrusting its head in the door. Berens and Sarah Ann hastily slid down into their seats. "Hurrah! Hurrah!" shouted Berens, waving his hat. "No more freckles!" shrieked Sarah Ann. "No more red hair. Oh, now I'll be Florabell Elizabeth!" The confusion was terrible; some said this and some said that, but each said it louder than the other. "Oh, fame! Oh, fame!" cried the poet and began racing wildly up and down the wish, while the little old lady hysterically threw her arms about the donkey's neck. "I'll soon be kinging it," thundered the little old gentleman, bringing his cane down with a thump upon the elephant's truck, at which the elephant awoke and began trumpeting like a brass band. "Who--o! Gee! Git up!" cried the horse, violently blowing his nose. "That's the way I'll manage 'em when I'm driving!" he explained to the company, who paid not the slightest attention. Berens and Sarah had seized hands and were spinning round like tops. "Somewhere Else! Somewhere Else!" shouted all of them at once, till the uproar was frightful. Indeed, you would have thought they had taken leave of their senses. But right in the midst of it, right in the very midst of it, I say, the Dissatisfied Bug burst pen the door of the wish with a flourish and snatching off his cap with I forget which of his 17 arms, waved it rough his head calling: "Somewhere Else! Somewhere Else!" "Somewhere Else! Somewhere Else!" bawled N. V. from the other end of the wish. "We're here!" screamed the passengers, and making a wild dash, plunged head over hoofs, over trunks, over heels from the wish. Hastily they untangled themselves. "O--ooh!" gasped Berens, who was the first to emerge from the tangle, and "O--ooh!" gasped Sarah Ann, her eyes big as saucers. In fact, the whole party could do nothing but stare. Below, the glittering spires of the city of Somewhere Else swam in a haze of purple splendor. It seemed to Berens the most wonderful city on the world. A stately palace with a hundred gold towers rose in the centre. Crystal fountains gushed coolly in the countless flowering gardens. All of the buildings glowed and shimmered in a silver mist. "Well!" said the Dissatisfied Bug, rudely breaking the silence that had fallen upon the company, "have you done staring? If you have, I'll just lead the way down." Without waiting for a reply he threw his many arms around N. V.'s neck and the two went rollicking off together. Berens tucked Rags under one arm and ran quickly after the two, followed by the other wishers, all of them still a bit dazed. They soon had come to the wonderful city itself and were walking slowly through its marble streets. A great many gayly dressed men and women were lined up upon the pavements as if for some sort of a procession. "I wish they wouldn't stare so!" whispered Sarah Ann to Berens. "The King! The King! The Queen! The Queen! shouted the populace, waving their hats and handkerchiefs in a frenzy of excitement. Berens and Sarah Ann nearly tumbled upon their noses in an effort to see all that was to be seen, while the elephant became so agitated by the noise and confusion that he whisked up a little man from the sidewalk and began waving him wildly, in lieu of a handkerchief, I presume. Berens had fallen upon his knees along with the rest of them, much to the disgust of Rags. "I'll not bow!" he snapped crossly from under Berens' arm. "I detest this bow-wowing!" "Hurrah for ILL! Three cheers for DE!" shouted a little man kneeling beside Berens. "Hurrah for ILL! Three cheers for DE!" roared the crowd. Berens had been looking curiously at the King and Queen and really they were a simply stunning pair in their diamond crowns and purple robes. Indeed, I wish you all might have seen them. But once or twice while Berens was looking at them they disappeared--crowns, cloaks, smiles and all! Yet when he rubbed his eyes and looked again there they were, nodding and bowing and smiling as blandly as ever, till he finally came to the conclusion that he must have been mistaken. "Who's Ill?" he asked, nudging the little man next to him. "Oh, hush!" cried the little man, looking about anxiously. "Do you want to be BEWILDERED? It's the Queen's name," he added in a low tone. "Illusion, you know, and De is the King's name. Oh, three cheers for ILLUSION AND DELUSION, King and Queen of Somewhere Else!" shrilled the little man hoarsely. There is no other thing so grand. And watch the porpoise fly! Yes, 'tis the place for me!